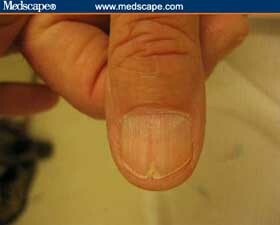 Nail clubbing involves a softening of the nail bed with the loss of normal Lovibond angle between the nail bed and the fold, an increase in the nail fold convexity, and a thickening of the end of the finger so it resembles a drumstick. 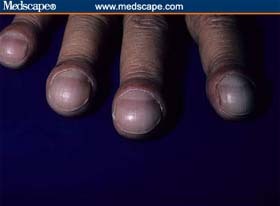 To determine whether nails are clubbed, have the patient place both forefinger nails together and look between them. 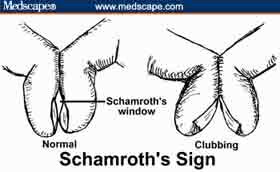 If you can see a small diamond space between them (Schamroth's window) then the nails are not clubbed (Schamroth's sign) (Figure 2). Figure 3: Example of clubbed nails. Note: Chronic obstructive pulmonary disease does not cause clubbing. Figure 5: Two Beau's lines suggest illnesses about 2 months apart. Intermittent doses of immunosuppressive therapy or chemotherapy can also produce Beau's lines. Severe zinc deficiency has also been proposed as a cause of Beau's lines. By noting its location on the nail, the approximate date of the illness associated with it can be determined (Figures 5A, 5B). Moreover, the depth of the line provides a clue to the severity of the illness. 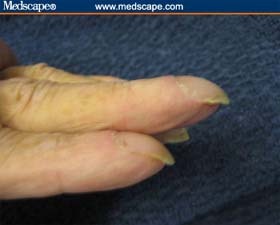 Figure 6: Note the thin nails in this woman with severe osteopenia. Darier's disease (striations are red/white). Figure 8: Central nail canal with Heller's fir tree deformity. 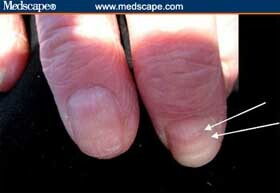 Figure 9: Indication of psoriasis. Figure 12: Example of a rough nail surface. 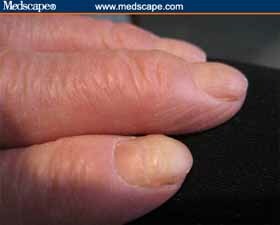 Onychomycosis, Chronic eczema, Peripheral vascular disease, Yellow nail syndrome & Psoriasis. Figure 13: Example of nail thickening. Thyrotoxicosis, Psoriasis, Trauma, Contact dermatitis, Tetracycline, Eczema, Toxic exposures (solvents), Blistering from autoimmune disease, and Porphyria cutanea tarda (onycholysis and skin blistering from sun exposure). 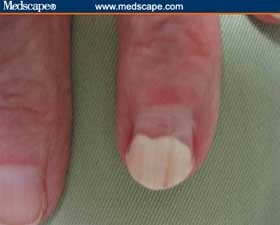 Figure 14: Traumatic onycholysis (involving only 1 nail). 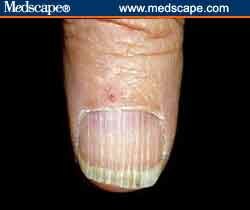 Figure 15: Example of nail thickening.